We’re the only the theatre company in the world to tour by narrowboat. 2019 Marks our 40th year of owning Tyseley! 83 years old and nationally important, Tyseley has earned her right to be on the National Historic Ships Register. Tyseley is our home and mode of transport for most of the summer months (not a floating venue, as some initially think). She’s a star in her own right, so we’ve dedicated this page to her. 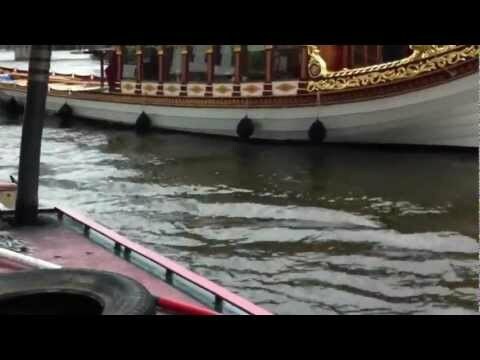 Tyseley had the pleasure of locking on the Thames with the Royal Barge – have a watch! Tyseley is powered by a wonderful Russell Newbery engine. Have a listen by pressing play below. Tyseley is a Town Class narrowboat, a large Northwich, 71’10” long by 6’11” wide, built in 1936 by Yarwoods of Northwich as part of the Grand Union Canal Carrying Company’s fleet. On nationalisation, she passed to British Waterways, finishing her commercial days on the cement run from Long Itchington to Camp Hill. Alan and Margaret Brooks took over Tyseley from Alan’s parents when they left the ‘cut’ in 1947. The Brooks family ran Tyseley in all from 1937 – 1954, firstly for the GUCCC and latterly for British Waterways, when Alan and Margaret went on the land in a little canalside cottage at Buckby. They continued to follow the fortunes of Tyseley right up to their deaths. Other boatmen that we know of to have had Tyseley either as a permanent boat or a ‘change boat’ between 1954 and 1961, the end of her BW days, were: Noel and Rene James, Johnny Tonks, John Henry Mees, Alf Reading, Billy Clews, Tom Smith, Mark Harrison, Chris Jones and Harry Bourne. Tyseley’s butties included Uttoxeter, Achilles, Bordesley, Brighton and Barnes. Tyseley was subsequently owned by Midland Canal Transport. Then in the 1960s, she was converted into the first-ever restaurant boat, based at Thrupp on the South Oxford Canal. Mikron Theatre Company has been using Tyseley for travelling the waterways on its annual National Waterways Tour since 1975, and has owned her since 1979. She has been the Company’s well-loved method of transport and home on tour ever since. Tyseley has survived as a true working boat throughout her life by adapting to the changing needs of the day. Since 1936, she has continued to move with the times, from carrying cement, through her career as a floating restaurant to getting a touring theatre company to their next show on time.